I’d like you to take a moment and think of the worst or the stupidest thing you have ever done in your entire life. Think about that. Now, imagine that for the rest of your life no one will ever let you forget about that act. Imagine if you were constantly seen and treated as if this one single act was the essence of your being. Unfortunately, Clarence Office, Jr., has had this experience. Clarence, who is African American, lives in Miami, FL. He served in the U.S. Army for three years in the 1970s and was honorably discharged. Like many veterans, Clarence tragically fell into drug use and was arrested for drug offenses. He served a prison term and paid his debt to society. Clarence now works with the Florida Department of Veterans Affairs and counsels other veterans who have encountered problems with the criminal justice system. Clarence matured into a model citizen and community leader. Because of his drug conviction, however, the State of Florida denies him the foundation of our country’s citizenship: the right to vote. Every election cycle, Clarence is not only reminded of his mistake as a young man, he remains sidelined from participating in our democracy. He paid his debt to society, yet he is continually punished. He has been branded by the State of Florida as an outcast. Our Jewish tradition offers an alternative vision for how we treat those who have done teshuvah, who have repented from past mistakes. If one is a penitent, another may not say to him: Remember your earlier deeds. When someone has done teshuvah, our tradition provides that we are not supposed to remind that person of the mistakes he or she has made in the past. To do so is considered a verbal assault, an act of deep cruelty. We are here tonight and for the duration of Yom Kippur because in our tradition a person’s whole life should not be judged by one mistake. If you think about it, this is a radical idea that Judaism bequeathed to civilization. In the ancient world, such as in Mesopotamia, it was one strike, and you’re out. A single deviance from a communal norm would result in the loss of a limb or even execution. Our history as Jews hinges on our belief in second chances. In the Book of Isaiah, the prophet’s words of hope and comfort bear witness to the return of Jews from Babylonian captivity to freedom in the Land of Israel. In 586 BCE, the Babylonians destroyed the Temple in Jerusalem and carried Jews into captivity. Our Bible depicts this as if the Babylonians were carrying out God’s punishment of the Jews for their sinful ways. The prophet reminds the exiled people not to despair. Yes, they sinned, but they have served their sentence. Through the prophet, God is urging the Jewish people to return home. The people made mistakes and suffered dire consequences. Yet, they repented and paid their debt. Now it’s time for the Jewish people to move on and rebuild their lives and their community. The phrase ki mal’ah tz’va’ah, “her term of service is over,” evokes a prisoner completing a sentence and returning to society rehabilitated. Unlike the Biblical model, though, America today is one of the most unforgiving places in the industrialized world when it comes to former felons returning to society. Common practice in the United States has been to deny voting rights to current and former felons, in some cases permanently. Individuals who break the rules of society, the thinking goes, should not play a role in making the rules of society. I believe such reasoning is faulty. A former felon who returns from a prison sentence pays taxes and is expected to follow other societal norms. People who make a mistake when young, paid the price and learned important life lessons have gained unique perspective and wisdom. They should have a seat at our communal table to shape our future. Instead, returning citizens are denied the essence of citizenship—the right to vote. Voting is not only a right; it is a responsibility to one’s community. Yet, too many are denied access to this civic duty. The number of disenfranchised citizens is staggering. Nationwide some 6 million people cannot vote due to past felony convictions. People of color are disproportionately represented. The shocking number of African Americans who are legally barred from voting and other civil rights due to felony convictions prompted lawyer and author Michelle Alexander to coin the phrase “the new Jim Crow,” in her comprehensive book by that title. She argues that the Voting Rights Act of 1965 was effectively undone by the last 30 years of mass incarceration that have had the effect of denying millions of African Americans their civil rights. Our State of Florida has one of the country’s harshest policies such that one out of every ten adults in our state cannot vote. Florida is one of only three states, along with Kentucky and Iowa, that permanently disenfranchises all citizens with felony convictions. In Florida alone, upwards of 1.5 million people with prior convictions, mostly African Americans, remain disenfranchised. Do the math. About one quarter of all African Americans in the country who have lost the right to vote are right here in Florida. This year, a grassroots organization Floridians for a Fair Democracy launched the Second Chances Florida campaign, which collected over one million signatures and succeeded to send a ballot initiative to Florida voters this November. If approved, Amendment 4 would restore voting rights to Floridians with felony convictions after they complete all terms of their sentence including parole or probation. The amendment would not apply to those convicted of murder or sexual offenses, who would continue to be permanently barred from voting unless the Governor and Cabinet restore their voting rights on a case by case basis (However one feels about these two exclusions, the amendment would greatly increase the number of eligible voters).The amendment requires 60% approval at the ballot box in order to become law. 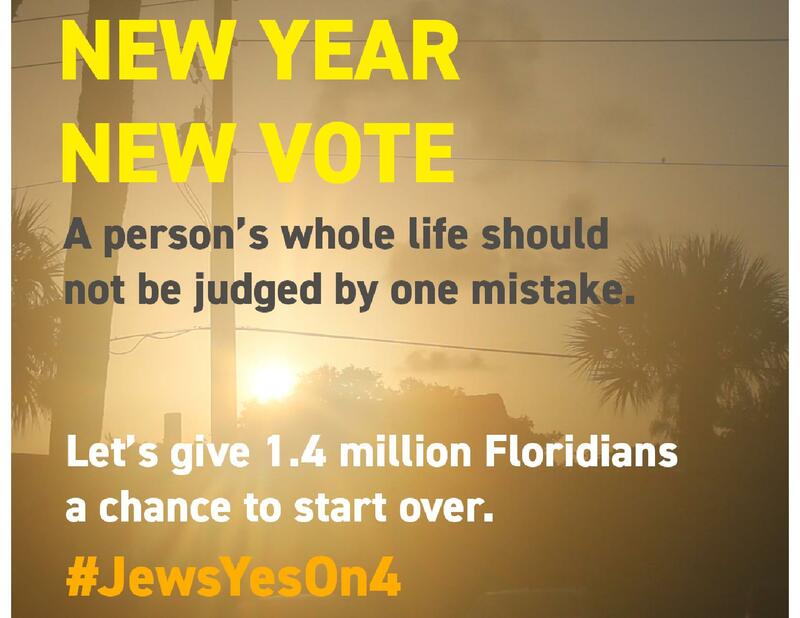 If we Floridians vote yes and pass Amendment 4, then we will repair a gross injustice. It not only will restore a basic right to our fellow citizens, it will empower returning citizens to feel invested as responsible citizens in communities throughout our state. Their deeper stake in society’s future will foster many more leaders like Clarence Office, and our society will be richer for it. Rabbi Jonathan Sacks writes: “To those who fully open themselves to it, Yom Kippur is a life-transforming experience. It tells us that God, who created the universe in love and forgiveness, reaches out to us in love and forgiveness, asking us to love and forgive others. God never asked us not to make mistakes. All He asks is that we acknowledge our mistakes, learn from them, grow through them, and make amends where we can” (YK Mahzor, lxiii). Yom Kippur calls upon us to learn from our mistakes and grow from them, and it calls upon us to be compassionate towards our neighbors who have made mistakes and grown from them. Our ancestors were punished for their mistakes, but when they paid their debt, God restored them to their former glory. I pray that God will open our hearts to those in our midst who deserve a second chance. Then, Clarence Office and many others will be able to vote, as is their right. Let us restore justice to our state and our country and build a world of love.